Okay this look is so perfect! I love that sweater and you look so cute in that beanie. Perfect outfit for winter! Love the lace in the back, so adorable! The sweater is so cute, and I love the beanie (and boots!) too! This weather has been crazy for sure! Love the lace up detailing and that beanie is adorable! That sweater looks so comfy. I love the color of it. You look so cute!! I love that sweater, the back is so fun! Oh that sweater looks so good on you. You totally rock that beanie. This entire look is perfection! Looks like it could be in a magazine! This whole look is just too cute and I love the details on your sweater! Yay for finally getting to enjoy our sweaters in Florida! This is so cute! You look gorgeous! I LOVE this sweater! The lace-up detail is seriously too cute! 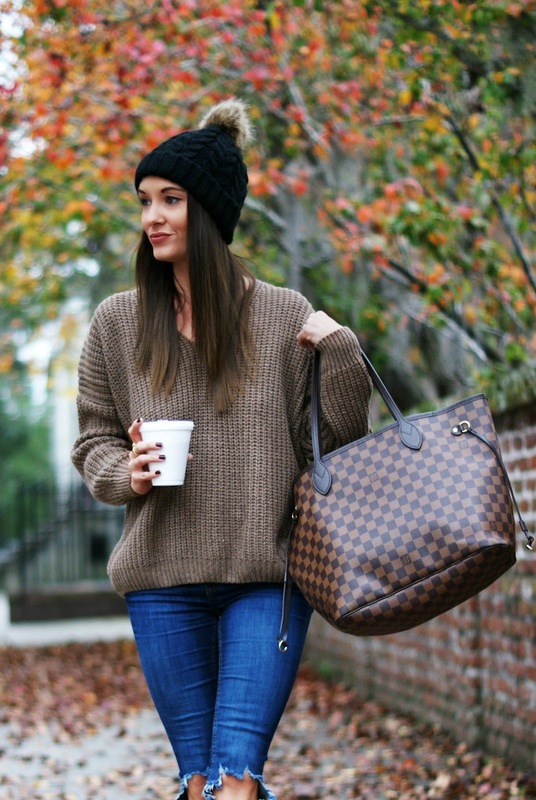 And your Louis is the perfect accessory! As always, love the whole look. The detail is really great and that beanie is so cute! That sweater is the cutest! Happy Friday, friend!